Home » ORGANIC CHEMISTRY » Alcohols » Alcohol synthesis by reduction of aldehydes and ketones. The most common reagents for reduce aldehydes and ketones to alcohols are sodium borohydride and lithium aluminum hydride. Lithium aluminum hydride is more reactive than sodium borohydride and reacts with carboxylic acids, esters and epoxides to give alcohols. 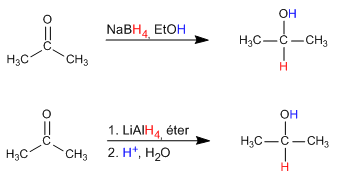 Lithium aluminum hydride also reduce alkyl halides to alkanes. NaBH4 donates hydride to the carbonyl carbon with simultaneous protonation of the carbonyl oxigen by the solvent. Lithium aluminum hydride transfers a hydride (hydrogen with its pair of bonding electrons) to the positively polarized carbon of carbonyl group. 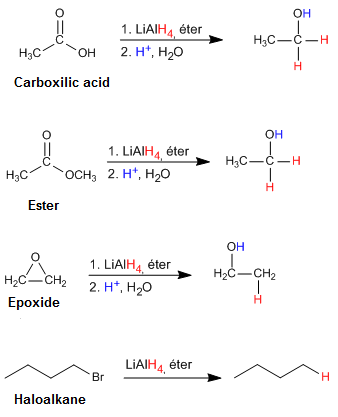 A separate hydrolysis step liberate the alcohol.